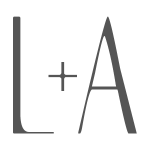 Even with my relaxed goal of sharing one recipe a week, I’ve fallen behind schedule. Over the last month, my husband has suffered a fractured ankle, my brother in law was hospitalized and my sister and I each had a medical scare arising out of bodily lumps and bumps that makes you wonder if you’re dealing with the Big C word. Thankfully, my husband is recovering just fine and my brother-in-law, while still facing a long period of physical therapy ahead, seems to be doing better. It was pure coincidence that my sister and I each discovered a bump that warranted being checked out and fortunately, both were determined not to be cancer concerns. No matter how prepared you think you are to handle anything, nothing beats receiving assurance from a professional that you and your family will be okay, especially if you’re a hypochondriac like me. So at the close of last week, once the good news all poured in, I breathed much easier, excited about returning to my normal routine. After shuttling between doctor appointments and hospital visits all I wished for was to be home, to relax, to prepare a special meal. This weekend my husband and I toasted to good health over a few lunch and dinner dates and Sunday dinner was as nice as I had hoped it would be. But the wonderful meal we enjoyed tonight will have to wait for another post. I want to share this dish with you that’s been patiently waiting in my draft box for several weeks. In fact, we enjoyed it so much that it might be time for it to make an appearance again. 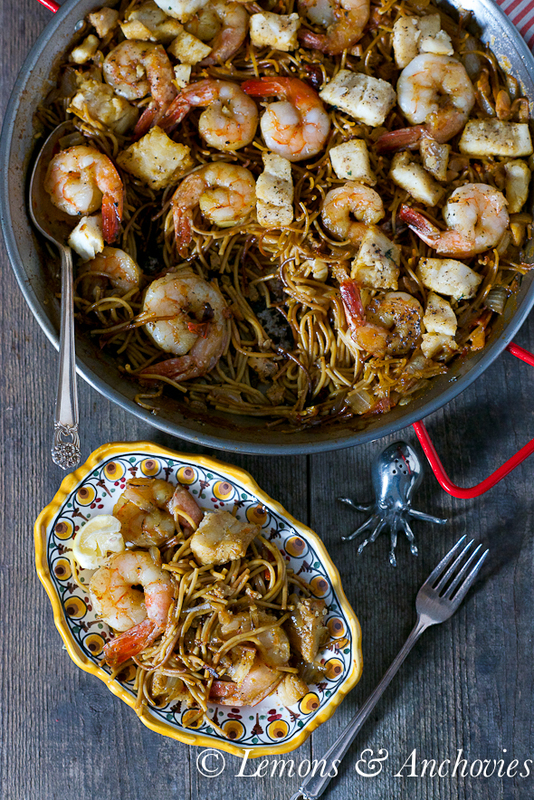 When paella meets pasta you get this: fideuà (fi-day-wah). 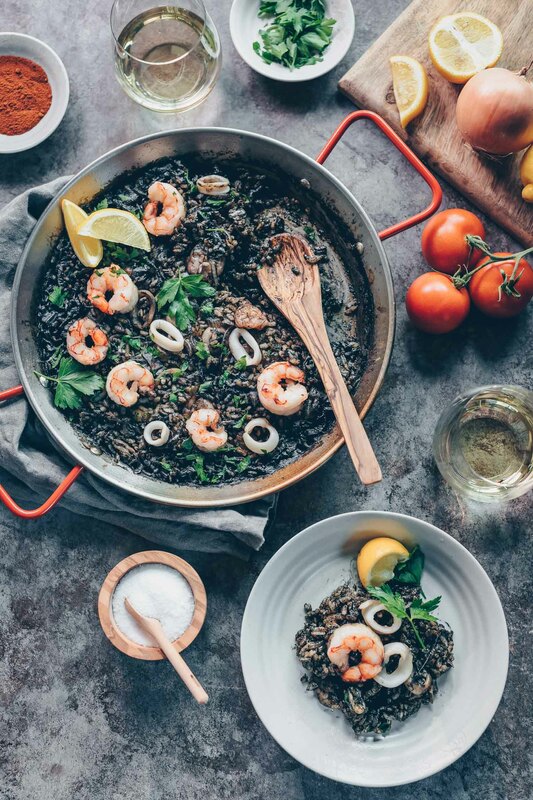 It’s a variation on the classic Valencian dish featuring rice, seafood and saffron, only fideuà is easier to prepare while retaining all the satisfying, tasty qualities of a classic paella. A few weeks ago I had a craving for paella but I didn’t have all the ingredients to prepare one so I made this out of what I had available. A traditional fideuà will usually have fresh shellfish in addition to shrimp and fish but this version didn’t suffer in quality at all. In a pinch, two pantry staples filled in to great results so that I didn’t feel at all bad about being too lazy to pick up the missing ingredients. My only regret? Waiting too long to share this recipe with you. As I mentioned earlier, the key difference between a paella and fideuà is the starch. 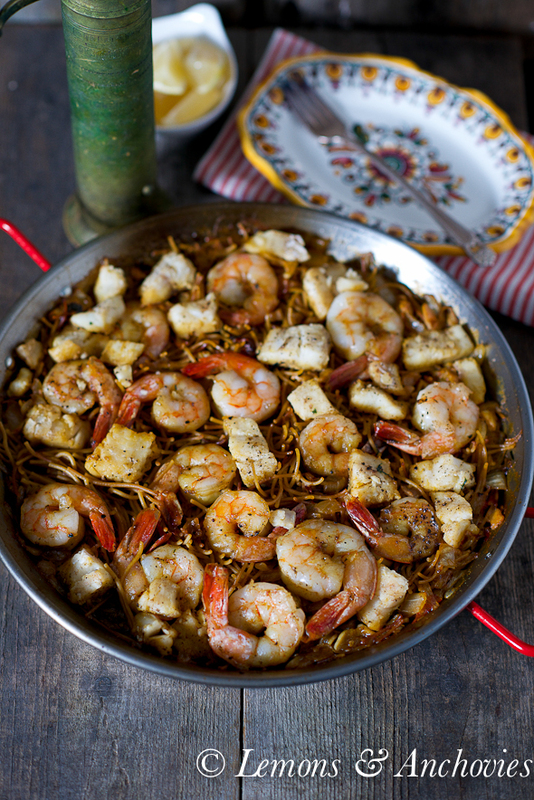 Instead of paella rice (Bomba or Italian arborio) fideus noodles are used for the latter. They are much like vermicelli noodles and it’s quite acceptable to use dried angel hair pasta as a substitute. In this version, I opted to use whole grain angel hair pasta, suspecting that a bolder pasta would stand up well to the seafood base and that turned out to be a good call. It’s harder to overcook whole grain pasta so using it here eliminated the concern of adding too much liquid, resulting in a soggy dish. It didn’t taste heavy at all. As a bonus, the natural, deeper color of the whole grain pasta better showed how flavorful this fideuà was. In the absence of fresh fish stock and shellfish, I used a combination of chicken stock and clam juice (from one can of chopped clams) to great results. The chopped clams and juice imparted enough seafood flavor that I didn’t miss the fresh clams and mussels at all. The key is in building flavor as this dish cooks. Caramelizing onions and garlic in the paellera (paella pan) provide the first layer of flavor, followed by smoked Spanish paprika which adds depth. 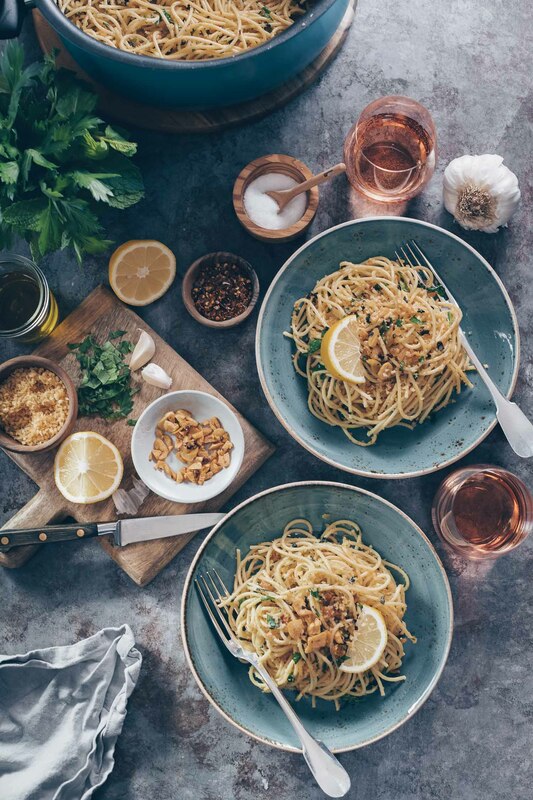 The rest of the ingredients–the saffron, seafood, even toasting the dry noodles before adding the stock–are important building blocks. If you try this dish and discover burnt bits at the bottom of the pan, don’t be disappointed. That’s the socarrat and it’s one of the best, most flavorful parts of any paella or fideuà. Socarrat equals success. If you’ve always been afraid of giving paella a try, consider fideuà. It’s less daunting (though once you try paella you’ll wonder why you were so afraid of it in the first place) and just as satisfying. 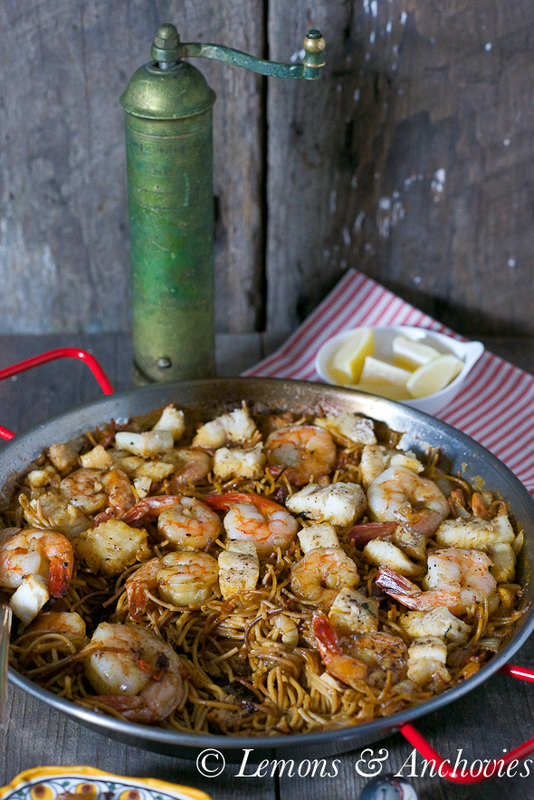 Fideua is the pasta version of paella--the Classic Spanish dish from Valencia. Use whatever seafood/meat combination you like. In my opinion it's actually easier than preparing the classic rice version and it's just as tasty. Season the shrimp and fish with salt and pepper. If using angel hair pasta, snap them into roughly two-inch pieces. Heat a few tablespoons of olive oil in a paella pan or skillet (see note) over medium heat. Add the shrimp and fish and cook until opaque but not cooked through, about 2-3 minutes. Transfer the seafood to a plate. 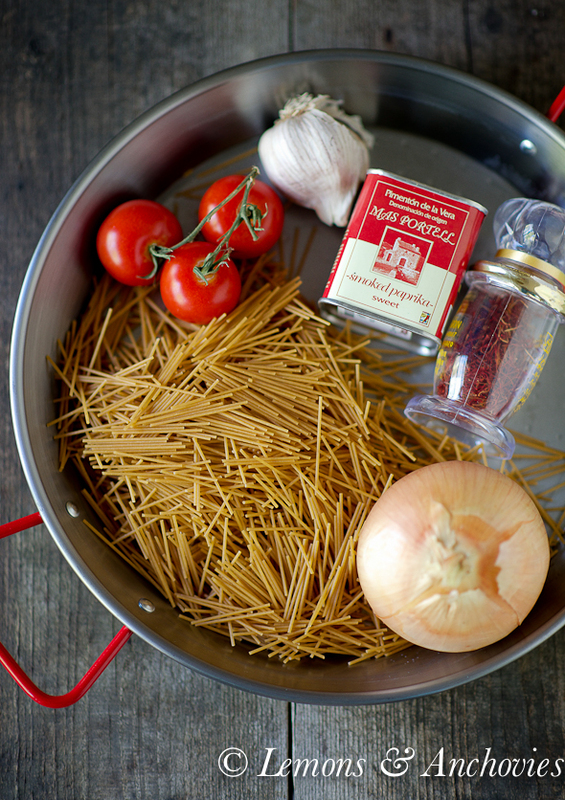 Add the dry pasta to the same pan; add a tablespoon or two of olive oil if your pan is dry. Toast the noodles until brown at the edges, about 3-4 minutes. If you use whole grain pasta like I did your pasta will already have some color so just watch for some crisp, dark bits on the ends of the pasta. Transfer the toasted noodles to a bowl. In the same pan, add another tablespoon or two of olive oil and the onion and garlic. Cook on medium to medium-high heat until the onions are translucent, about 1-2 minutes. Season with salt and pepper then add the tomatoes and Spanish paprika. Cook until the tomatoes have cooked down, about 2 minutes. Be sure to watch the heat of the pan. Paella pans can be thinner than regular stainless steel pans so if you see the pan turning black, lower the heat. Add back the noodles along with the clams and juice, 3 cups of the chicken stock and the saffron. You may not need the last ½ cup. Bring to a boil then lower the heat to a simmer. Cover and cook until the liquid has been absorbed by the noodles, about 8 - 10 mins (depending on your stove, the pan you're using and the pasta, your time may be shorter or longer. This dish is hard to get wrong, though. Just check the noodles and liquid every few minutes). Use aluminum foil to cover your paella pan since they don't normally come with lids. About 5 minutes before you plan to turn off the heat, layer the partially-cooked seafood on top and cover with foil again. If you feel the liquid is dissolving faster than the noodles are cooking, add the remaining ½ cup of stock. Even if it looks like the finished dish has too much liquid, the noodles will continue to absorb it. Don't fret if you have dark bits that have stuck to the pan--this is the coveted socarrat and it has lots of flavor! Set the entire paella pan at the table for a family-style meal. Garnish with lemon wedges. I used a 12-inch paella pan and it's supposed to serve 6. Realistically, this will serve four as a main course. That dish looks ever so scrumptious! A great alternative to paella. 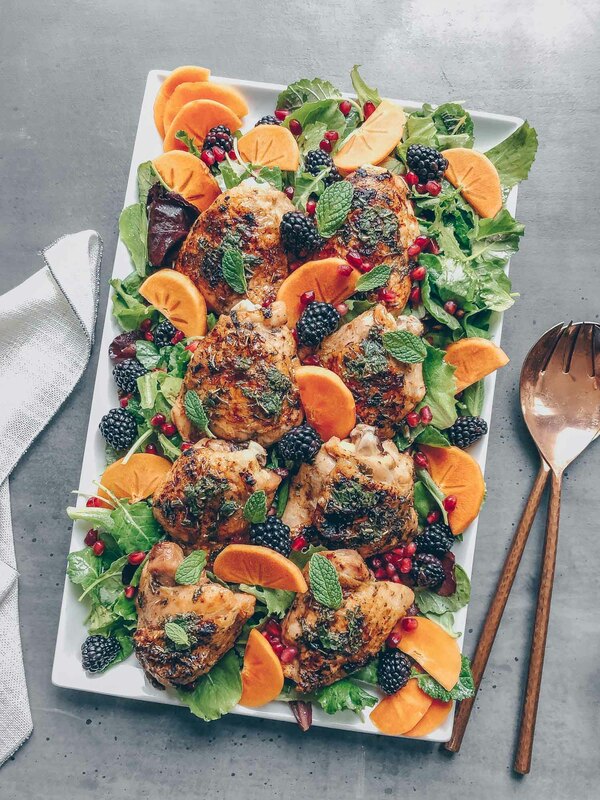 Wow, this looks easy enough to pull off on a week night…especially now that my kids have decided they’re “off” rice…thanks for sharing! Your fideua looks mouthwatering! I’ve never tried it but I love paella so I have a feeling I’d love this too. Glad the medical scares are behind you and that you were able to celebrate this weekend :). Sorry to hear that, hope things are getting better and better. It must have been awful that everything fell at the same time, but glad that you managed to hold things back together. And this fideua looks fantastic. I’ve only tried paella, but it’s good to learn about fideua. Can’t wait to try this. This dish it totally new to me, I have not heard of fideua, but I am loving how if looks…and can only imagine how taste it must be…beautiful dish! Wow Jean, sounds like you have had quite a busy and a “hold your breath” kind of life lately, so glad that good news prevailed. As always your photos and recipes look delicious and simple. Have a wonderful weekend Jean. This dish looks delicious! Love the flavours, bookmarking to try! Thanks for sharing! I would like to make this dish tomorrow; any quick repsonses please for a specific gluten free Fideua pasta replacement please. I don’t have any experience with gluten-free pastas but you should be able to use your favorite gluten-free angel hair pasta or thin spaghetti here. You don’t have to use fideus noodles for this recipe. Hope this helps! BTY – how much is a pinch of saffron? maybe 1/4 teaspoon?